Chef Sam Choy, Shirley Kauhaihao and Chef Scott Hiraishi. A new series of videos and publications to help Hawaii’s growers, consumers and chefs become more familiar with breadfruit has been released by the Ho’oulu ka ‘Ulu project. The videos and publications were deigned to assist growers in supplying grocery stores, restaurants and farmers’ markets with high quality fruit; they were also designed to help chefs become more familiar with breadfruit handling and preparation in the kitchen. In addition, backyard growers, consumers and educations will find information relevant to home and community use of breadfruit. The production of breadfruit is expected to increase dramatically—representing millions of dollars in potential retail sales of breadfruit in the next five to eight years. The increase is due to the sales and distribution of thousands of breadfruit trees in Hawaii in the past few years. Breadfruit can also play an increased key role in island food self-sufficiency, as it’s been a primary staple food in the Pacific for thousands of years, according to the Ho’oulu ka ‘Ulu project. The new videos and publications demonstrate how to properly harvest, handle and utilize breadfruit to fully realize its commercial and community value. The 24-page Breadfruit Production Guide: Recommended Practices for Growing, Harvesting and Handling is aimed primarily at breadfruit growers. The guide details best practices for harvest and post-harvest handling to optimize value in the marketplace. The guide explains how to identify and pick breadfruit when it is mature, at its optimal flavor and marketability. A corresponding video, Harvest and Post-harvest Best Practices, provides a visual demonstration of the key practices outlined in the Breadfruit Production Guide. An additional video, Handling and Preparation of Breadfruit, features Chef Sam Choy in explaining how to prepare breadfruit from start to finish. Peeling and cutting, and various methods of cooking—steaming, boiling, frying and baking–are demonstrated in the video. 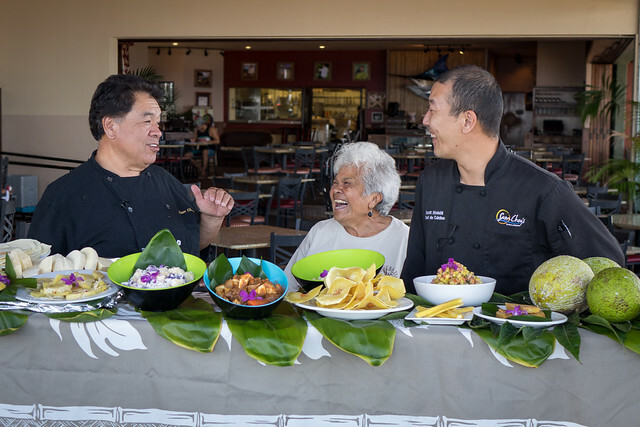 Choy is joined in the video by Chef De Cuisine Scott Hiraishi of Sam Choy’s Kai Lanai, and cultural practitioner Shirley Kauhaihao of Honaunau. Additional new publications highlight basic preparation, nutrition and information about the varieties of the fruit. Brief Breadfruit Basics is a two-page publication that features basic handling and preparation methods. Breadfruit—Nutritional Value and Versatility highlights the nutritional qualities of the fruit. Also, because each variety of breadfruit is slightly different in how it looks when mature and in its taste the organization has published Breadfruit Variety Cards which describe three common varieties of breadfruit in Hawaii—Ma‘afala, ‘Ulu and Meinpadahk. The cards are designed to help growers and chefs understand the subtle differences when harvesting and preparing in the kitchen. The videos and publications are produced by the Ho‘oulu ka ‘Ulu—Revitalizing Breadfruit project and are sponsored by the State of Hawai‘i Department of Agriculture. Ho’oulu ka ‘Ulu is a project to revitalize ‘ulu as an attractive, delicious, nutritious, abundant, affordable, and culturally appropriate food that addresses Hawaii’s food security issues. Ho’oulu ka ‘Ulu is a project of the Hawaii Homegrown Food Network and the Breadfruit Institute of the National Tropical Botanical Garden. All of the videos and publications are available for free download at breadfruit.info and breadfruit.org.